Smartwatches don’t have to be just for adults; in fact, there are now a range of smartwatch models on the market that cater to a younger audience, some offering games and learning development, which can be a great reason to invest in some wearable tech for when they’re on the go. These are the best smartwatches for kids, with some smart fitness trackers thrown in too. Because during the summer holidays, you want to make sure your kids are staying active, rather than spending every day in bed playing Fortnite. There are a range of different features you can look for in a kids smartwatch; some are purely for entertainment, whereas some have great learning development exercises such as the LeapFrog LeapBand Activity Tracker or the VTech Kidizoom Smart Watch. If you’re an active family, then the Fitbit Ace is the latest kid’s edition from Fitbit which can help motivate your children and track their activity. 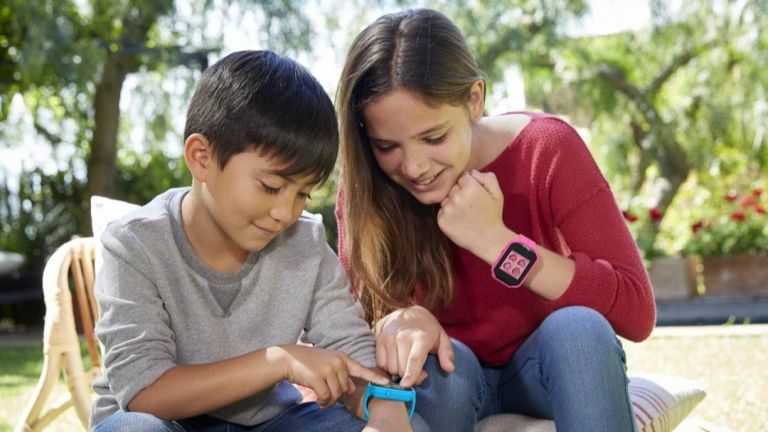 Finally, some kids’ smartwatches are designed with safety in mind, including a GPS tracker which parents can monitor to ensure the whereabouts of their children at all times. Whatever you’re looking for, our list below has something for everyone, read on to find out more. This Garmin kid’s smartwatch has a whole range of functions which can make every day a little bit of an adventure. It’s a durable watch that is fine to be bashed around, and you can award points for doing daily tasks and chores. The idea is these can then be traded for treats, so your children have an incentive to brush their teeth or play nicely with their brothers. The colour screen and strap are customisable, and the latter is soft and stretchy, designed to be comfortable to wear both day and night. The VivoFit Jr 2 won’t need charging because the battery lasts for 'up to' a year. It actually seems to be more like 6-7 months, but that's not bad, and will vary depending on use. Essentially a Fitbit Alta with a simplified app that allows parental supervision, the Fitbit Ace is a great way to encourage and motivate kids to get moving. This slim kid’s smartwatch is designed to track daily steps and make it fun by providing rewards and badges for hitting certain goals. It’s water resistant so you don’t have to worry about them going out and ruining their new bit of tech at the first sign of rain, and battery life lasts up to 5 days so it’s perfect for wearing all week to school. You can set up a family account if you all have Fitbits so you can view your children’s progress easily, and they can customize their watch face with 10 funky clock designs. VTech have created the ultimate kid’s smartwatch, that has a lot of cool features but won’t burn too much of a hole in your wallet. This watch has a camera for taking photos and videos, a motion sensor for tracking activities, and has a range of games and apps to use. There are over 50 different 3D-effect clock faces- both digital and analogue depending on your preference and you can download all your favourite games and apps to customise this kid’s smartwatch. This kid’s smartwatch is practically a smartphone for the wrist. Just like an adult smartwatch, it features a range of apps, a camera for photos and video, and the ability to send messages. Other features include a media player, activity tracker and a hands-free kit for use with a smartphone. It comes with two interchangeable straps for personalisation- one of which is a thermal colour changing one! You can expand the 256mb of memory to 32GB so you can store a wide range of apps and media on this device. This smartchwatch from LeapFrog provides you with a virtual pet, just like the good old Tamogotchis from the 90s. You can feed and power your pet by completely activities or exercise to gain points. This watch is designed to teach your child core skills with a full curriculum that will have them learning how to tell the time and the importance of nutrition. There’s a range of games to play but the parental controls will allow you to limit the time your children spend playing, so that they can focus during school time and bedtime. For those who are a little worried about their children venturing out on their own in their younger years, this kid’s smartwatch is a great way to give both parent and child peace of mind that they can stay in contact at a touch of a button. Rather than allowing them a smartphone, this watch has a GPS tracker that will allow you to quickly and easily locate where they are at all times. If there is a particular neighbourhood or area you feel they shouldn’t go to, you can set up an alert so you will be notified if and when they enter a specific area. It’s easy to call and message and the watch also has a camera for taking photos.